Thank you for your interest in bringing Living Yoga’s trauma-informed yoga classes to your site! Living Yoga strives to create a successful trauma-informed yoga experience for the students we serve and our volunteer teachers. While we accept program inquiries on an on-going basis, it is difficult to predict when new classes will launch. Factors such as location, day and time of class, volunteer availability, & partner staff capacity need to be carefully considered before beginning a new class to ensure program sustainability. This process could take anywhere from 12 weeks to 9 months. Our partner sites contribute to the cost of programming, with sliding scale cost share pricing that ranges from $500 to $2,500 per year for weekly classes. This contributes to the costs of volunteer recruitment and training, volunteer support, coordination of class schedules and logistics, program management, and outcome evaluation. Living Yoga covers the majority of program expenses with the generous support of individual donations, corporate sponsors, and grants. Mission and Program Match - We seek to partner with organizations and facilities that will integrate the Living Yoga classes as part of, and complementary to, their program's work and mission. Population(s) served - We serve students who otherwise might not have access to yoga, including (but not limited to), youth and adults in prison or detention facilities, drug and alcohol treatment centers, mental and behavioral health programs, transitional services and other programs for marginalized community members impacted by trauma. 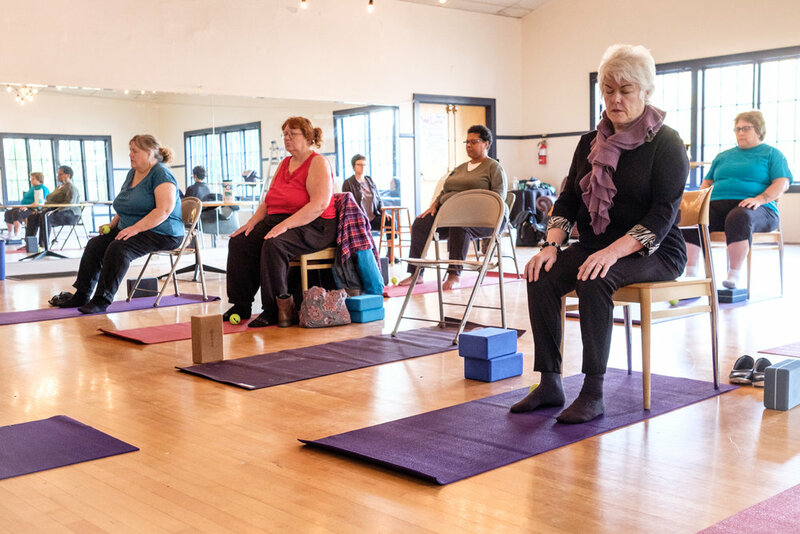 Infrastructure for a Living Yoga Class - We ask that our partners provide staff support for the class, a space conducive to a yoga practice, and storage for yoga mats and class supplies. Student Base Participation - We seek to have at least six students in each weekly yoga class. Volunteer Availability - All Living Yoga classes are taught by trained volunteers. Our ability to take on a new partner site is partially dependent on the availability of our volunteer teaching teams. If you feel that your organization is a good potential match for partnership with Living Yoga, please fill out an application. We look forward to connecting with you soon! You can view a list of our current partners HERE﻿.